*Short walk to the Iron Horse lift with access to both the Moonlight and Big Sky ski slopes. *Walk to dinner, apre skiing, shopping and beautiful Moonlight Lodge! *Breathtaking views from our private deck, stocked with a grill and private hot tub! Ski-in, Ski-out to the largest ski-able terrain in the Country! * Ski-in, Ski-out (during heavy snow years)to Moonlight & Big Sky! * Steps to Moonlight Lodge, Dining, Hiking, & Shopping! * 3 bedrooms, 2 ½ Bath, with Private Deck & BBQ! * Satellite & Internet service! * Private Outdoor Hot Tub! In about 20 min you are in the world’s first National Park. One of the planet’s most unique collections of geography, geothermal activity, and wildlife. We have world renowned Fly Fishing out our back door (Madison and Gallatin River). This newly remodeled Saddle Ridge town home with ski-in, ski-out access to the largest skiable terrain in the country offers all the luxuries of a 5-star resort at an affordable rate. Enjoy gorgeous, unobstructed views of the Spanish Peak Mountains from the luxury of your bedroom. The Master suite with ‘bonus area’ is located on the 3rd floor while the lower level houses 2 bedrooms and a full bath. For your convenience, there is a washer/dryer located on the lowest level. The main level features an expansive, newly remodeled living/dining area with HD satellite and Internet service. Enjoy breakfast out on the deck or at the breakfast bar. Or snuggle up with your kids and loved ones in front of the cozy gas fireplace in the great room. The Moonlight Lodge is only steps from the front door and offers exclusive fine dining, après skiing, shopping and much more! No need to pay expensive gas prices, a car is just not necessary! Leave the car parked conveniently at your front door and walk to all the resort's spectacular amenities, or take the free shuttle to the lower Big Sky Villages! Or even take a shuttle from the airport and avoid a rental car entirely. Unit in great shape. Come SKI THE LARGEST SKIING IN NORTH AMERICA. Keywords: luxury, Condominium, condo, ski-in, ski-out, hot tub, house, 3 bedroom, big sky, moonlight, wireless, wi-fi, available, best rate, great rate, kid friendly, kitchen, great reviews, new, fly fishing, Yellowstone National Park, Whitewater rafting, wildlife, summer, serene, pristine, sleeps 9, aprs, lodge. We are local to the area and own Outlaw Brewery in Bozeman. Swing in after you land and we will give you a fresh growler of local beer to enjoy for your first night in our beautiful condo. We chose this location because of its ability to ski to and from both Big Sky Resort and Moonlight Basin Resort. Also the ability to walk to Moonlight Lodge with its great restaurant, bar, shopping, concierge etc... really completes the experience of staying up here. Finally we believe that the Best Views in Big Sky are from right here! Location to Moonlight Lodge is unbeatable. Serenity and amenities of this Mountain Location cannot be beat anywhere in Big Sky, in our opinion. We are unit M2. toilet, combination tub/shower, Tub/shower & toilet seperate from sink area. Spanish Peaks from back/Hottub. Lone Peak (Big Sky/Moonlight) ski runs from front of condo. Requires skiing through parking lot, otherwise 3 minute walk to lifts. high quality and high thread count linens and spares provided. washer and dryer are inside unit in lowest level. Log balcony, over looks Spanish Peaks Mountain Range. 3 min walk to the stunning Moonlight Lodge (bar, restaurant, spa). This condo is very nice and provides beautiful mountain views. 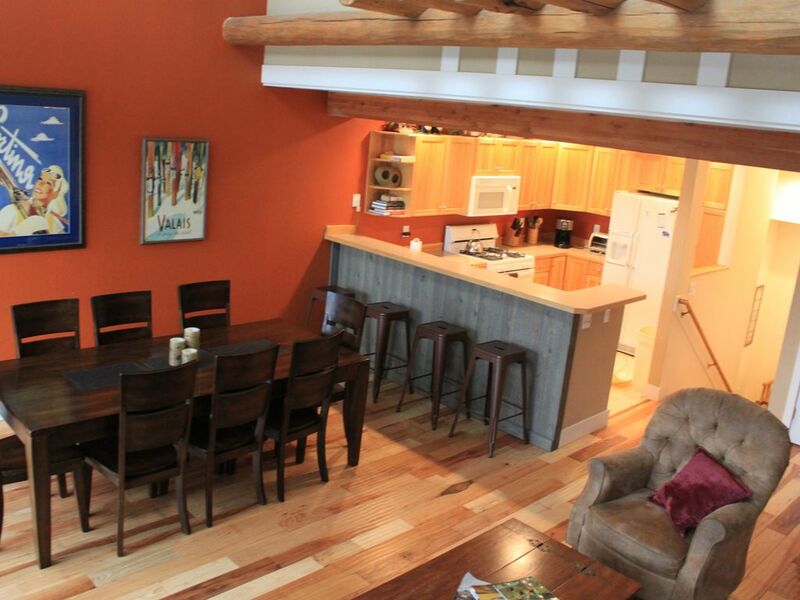 Highlights include a well-stocked kitchen, lockable ski racks, and great communication and flexibility from the hosts. Great place for a group trip to Big Sky. Excellent location - walkable to the slopes and lifts, plenty of room and beds, well stocked kitchen, very clean and well equipped! Highly recommended! Good value if Moonlight Basin is right for you. Overall a nice property and the owners communicated very well before and during our rental. The shuttle buses rarely run out to Saddle Ridge condos, so you probably will want a car if you plan on visiting the main base area. We chose not to pay the $100 per day "cover charge" to use the Moonlight Basin Lodge facilities. Our only complaint with the unit itself was the noise level when people for walking on floors above the bedrooms on bottom floor. We would rent this unit again if coming back to this location. Great condo in the perfect location! We thoroughly enjoyed our stay here. The condo is adorable and has amazing views of the mountains. Fully equipped kitchen allowed us to stay in and watch the snow fall on evenings that we didn’t eat out at one of the great nearby restaurants. Can’t wait to come back!! Amy, we are so glad you had an enjoyable time!! It was great communicating with you and we hope you return soon! The townhouse was very nice and well-maintained. The kitchen was equipped with everything we needed. The townhouse was close to the Madison Base. The owner Nicole was very accessible and answered all questions immediately. We had a great stay! We are so glad you had a great stay! Please come back and stay with us anytime! Jason, so glad you have a wonderful stay! Come back anytime! Cheers! Major shopping, theater, cinemas, museums etc. are in Bozeman 45 miles away. Movies are also played at Huntley Lodge in the Mountain Village. Please contact us to see if we may be able to give you a better rate!